The intermittent rain did not seem to matter. Neither did the traffic. Catholics just kept arriving in front of Sony headquarters on Madison Avenue in New York City. 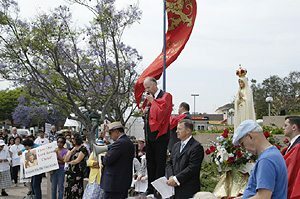 In all, nearly 500 protesters braved everything to join the June 24 rally of reparation against The Da Vinci Code movie organized by the American Society for the Defense of Tradition, Family and Property (TFP) and its America Needs Fatima campaign. A similar rally with nearly 150 present was held at Sony Pictures in Los Angeles. Somehow the New York rally was symbolic of the whole campaign against Sony’s The Da Vinci Code movie. Protesters faced all sorts of obstacles when organizing their vigils in front of theaters. They confronted peer pressure, discouragement and broken promises. They faced yells, screams and obscenities. They braved rain, heat and the elements. Yet the protests just kept coming. The protesters did not back down. 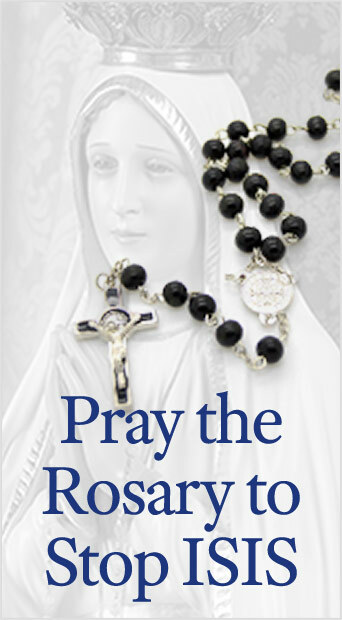 Relying on God and His Blessed Mother, they put together 2,092 vigils of reparation and protest nationwide. Some protests gathered together nearly 200 people. Others had dozens; some people protested alone. The important thing was that they were held. Protesters also organized over 1,000 Holy Hours of reparation on June 18. From coast to coast, in every state, it became very clear that Americans rejected blasphemy. 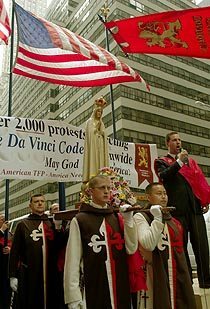 The June 24 rallies were the culminating point of the American TFP’s long fight to reject The Da Vinci Code in both its book and film versions. Activists gathered at the two Sony headquarter locations to voice their concern and outrage to the corporate entertainment giant. The American TFP organized programs of speakers and prayers for the two-hour events. Perhaps one of the most exciting aspects of the rallies was the fact that Catholics were literally bringing Christ and His Blessed Mother back into the public square from which they have been so ruthlessly excluded. 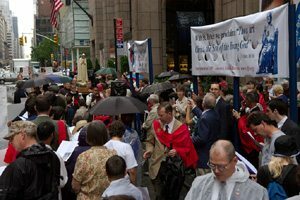 In New York, a solemn procession with a statue of Our Lady of Fatima, escorted by members wearing the TFP ceremonial habit, made its way through the crowd that spilled out into the street. No one was ashamed to proclaim Christ before men. Praying the rosary on Madison Avenue was especially memorable. Led by the strong voice of Father Gregory Karpyn of Girardville, Penn., protesters prayed loudly and joyfully, oblivious to the secular city surrounding them. Participants also sang hymns and shouted slogans such as “Viva Cristo Rey!” (Long Live Christ the King) that echoed off the skyscrapers. Passersby were clearly not oblivious to the throng as they stopped to observe such a rare sight. A few Catholics joined the protests straight from the sidewalk. One couple from England upon learning of the protest cancelled their plan to buy a laptop at the nearby Sony store. For such a theme, there is no better speaker than Chicago’s pro-life activist Joe Scheidler. He reminded the crowd: “We are the Church Militant. We are not the Church sitting around. We are not the Church waiting to see things happen.” The fiery director of the Pro-Life Action League remarked how Catholics have not the option but the obligation to come to the Church’s defense when unjustly attacked. Joseph A. D’Agostino, vice president for Communications at the Population Research Institute also delivered some remarks against the blasphemous film. The rallies highlighted the fact that a lot had changed since the first protests. In the weeks leading up to the May 19 worldwide launching, The Da Vinci Code was heralded as the year’s most eagerly awaited and controversial film. The movie was only the tip of the iceberg to all sorts of books, documentaries and reports denying Christ’s divinity. The media discouraged oppposition by repeating the myth that protests only fuel ticket sales. On May 19, the movie opened with plenty of fanfare and impressive opening weekend ticket sales. Many TFP protester organizers nationwide were swamped by calls from reporters all too eager to report on grassroots reactions and their seemingly failed attempt to stop the popular movie from showing. However, after the first weekend, the climate radically changed. Box office receipts fell astonishingly flat. The media were no longer interested in discussing so many of the “fascinating” religious issues they had long claimed the film raised. A deafening silence descended over the film. In other words, once the media perceived the film had no future, they abandoned the film to its own fate and moved on to other things. In the debate as to whether protests fuel ticket sales, one fact does stand out. In the United States where there were over 2,000 protests in front of theaters, the film fell flat. However, the film did enjoy success in international markets where there were no protests. Indeed The Da Vinci Code was The Passion of the Christ in reverse. American attendance accounted for a huge percentage of the total gross ticket sales of Mel Gibson’s film. In the case of The Da Vinci Code, Europe and the world saved the day, accounting for over seventy percent of total receipts. Moreover, its lackluster performance in the United States jeopardizes the chances of the film winning awards in Hollywood. Negative publicity whether in theater protests or bad reviews seems to have stalled The Da Vinci Code juggernaut that seemed so unstoppable a few short months ago. The somber silence surrounding The Da Vinci Code contrasted with the loud, joyous prayers and the honks of support by passing cars heard at the TFP rallies in New York and Los Angeles. The Da Vinci Code book and movie may not be remembered as a significant film, but it will be remembered by countless American Catholics as a time when thousands of Catholics facing enormous obstacles stood up to today’s secular culture and proudly defended the honor of Our Lord and His Blessed Mother – and a time when they prepared for more battles yet to come.